Ballyhoo and Laird partnered to take an empty tradeshow booth and brand it to get the Laird story popping! Our story begins with Laird planning to take part in its first-ever Mobile World Congress tradeshow, the largest annual global mobile technology tradeshow with more than 2,000 exhibiting companies and more than 93,000 attendees. Laird needed to make a big splash in this highly competitive environment. The company wanted their visual floorplan to pop. A blank canvas across a large footprint at the Mobile World Congress tradeshow venue, coupled with the need to display several areas of expertise covering multiple global business units meant strategic design could be used to convey the Laird story. Enter Ballyhoo! They worked with marketing, sales and several business leads across Laird to develop a cohesive floorplan. Not only was every display surface designed by the team, but additional materials including videos, PPT presentation components and marketing literature were developed by the Ballyhoo team to complete the cohesive visual story. In the end, Laird’s footprint at the Mobile World Congress tradeshow was highly visible, well-branded and tied together with cohesive messaging. The traffic flow was great and provided quite a few sales leads for the Laird teams. As their agency of record for all of their creative needs and brand development, Ballyhoo once again saved the day! 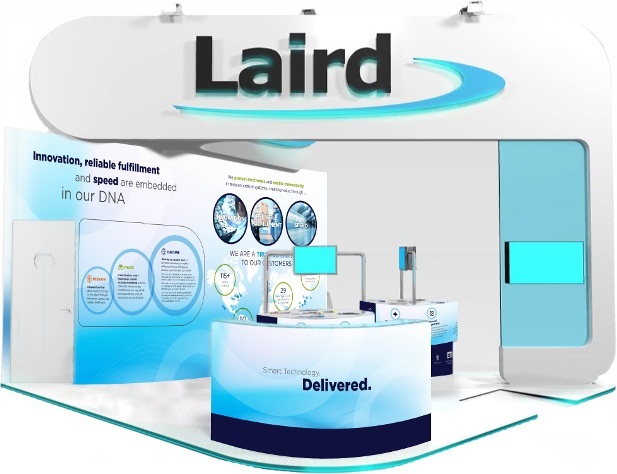 Laird was able to utilize our Graphic Design and Executive Presentations solutions and build consistent messaging across the tradeshow floor.